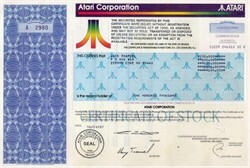 Beautifully engraved clean scarce certificate from the famous Atari Corporation issued in 1987. This historic document was printed by the United States Banknote Corporation and has an ornate block border with a vignette of the famous company logo. This item is has the printed signature of the company's president, Jack Tramiel. Atari certificates are highly desirable. This certificate was for unregistered stock for 100,000 shares made out to Jack Tramiel dated June 1987. There are not many of these around! Jack Tramiel was the President of Atari and also the founder of Commodore Computers. In 1953, Jack Tramiel opened a type writer repair shop in the Bronx, New York. Two years later he relocated to Toronto and founded Commodore. A journey from type writers to mechanical adding machines started. In the seventies Commodore went into the electronic pocket calculator business. After surviving the price wars with Texas Instruments, Commodore bought the semiconductor company MOS Technology in the mid-seventies. MOS' senior engineer, Chuck Peddle was working on the 6502 micro processor. A popular 8 bit processor that soon would be used in machines like the Apple II, the Atari 800, the Commodore PET and 64. But first it made its appearance on the KIM-1, a single board computer featuring a hexadecimal display and keyboard. That was Commodore�s entrance into the world of micro computers. In 1977, Commodore introduced its first personal computer at the industrial Fair in Hanover. That was the birth of the PET, the Personal Electronic Transactor. A whole family of Commodore business computer was about to follow. Those machines, like the CBM 8032 were successful until the mid eighties. But Jack�s vision were computer for the masses. In the early eighties Commodore entered the home computer market with the low cost VIC-20. A friendly computer which got very popular. But that was only the beginning. In 1982 Commodore introduced the Commodore 64, the successor of the VIC-20. With its competitive price it drove Texas Instruments and many others out of the market. The computer was probably built over 20 million times. Commodore rose to a one billion dollar company. At the top of its success Jack Tramiel had a disagreement with the major share holder, Irvin Gould. Jack left Commodore and a few months later bought Atari. Atari was established in Sunnyvale, California, in 1972 by Nolan Bushnell, an engineer who produced his first video arcade game while tinkering with microcomputers at home. The game, Computer Space, developed in 1971, was a commercial flop, but Bushnell's 2nd arcade game, Pong, became an overwhelming success. Atari sold 10,000 Pong units in 1973 and 150,000 home versions in 1975. Atari's success lured others into the industry, including Magnavox, Bally, Coleco, and RCA. With the added competition, prices dropped and the demand for new games increased. By 1976 the enthusiasm for home video games had waned, and Atari was in need of an infusion of capital. That year Bushnell sold Atari to Warner Communications for $28 million, of which Bushnell received $15 million. Bushnell left Atari 2 years later and went on to start Chuck E. Cheese pizza parlors, among other things. In 1979 Atari's sales picked up because of the popularity of its Video Computer System (introduced in 1977), a cartridge-loaded color graphics console that sold for $200, and the success of its newer, more advanced video arcade games (Asteroids and Missile Command). In 1980 Atari's revenue of $415 million represented 1/3 of Warner's sales. Atari introduced its first line of personal computers in 1980. Initial sales were disappointing, however, and the company lost $10 million on computers in its first year. By 1982 interest in video games had diminished. In 1983 Atari's competitors began dropping out of the market, and Atari lost $533 million. In 1984 Warner sold Atari to Jack Tramiel, former CEO of Commodore, Atari's prime competitor in home computers. Tramiel had Atari in the black in 1986, with net income of $25 million on revenues of $258 million. Contributing to the turnaround were Atari's successive introductions of low-cost personal computers. In 1988 Atari lost $84.8 million largely because of the discontinuation of certain operations of its electronics retail chain, Federated Group (acquired by Atari in 1987). Atari placed Federated up for sale in 1989, and in 1990 the company sold 26 of its California stores to Silo and closed the rest. In 1992 a US district court threw out Atari's $160 million lawsuit charging Nintendo with illegally monopolizing the video game market in the late 1980s. Plummeting sales in the 1990s forced Atari to bite the bullet and restructure its operations, drastically cutting staff and downsizing its international operations. Atari invested heavily in the development of a multimedia game system that would allow Atari to get ahead of its rivals. In 1993 the company launched the Jaguar as the only 64-bit interactive media entertainment system available, and Atari sold around 200,000 units (at $250 each) in its first year on the market. In 1994 Atari agreed to make its library of game patents available to Sega in return for Sega's investment of $90 million in the company. That year Atari teamed up with Virtuality Group of the UK to create virtual reality games for the consumer market. Earnings plummeted in 1995 as Atari cut prices on its Jaguar multimedia interactive entertainment system in an effort to boost sales. In 1996, the company announced that it was starting a new business called Atari Interactive to make and distribute games for personal computers. The video-game pioneer intended to draw heavily on its library of 1980s-vintage video games, such as Asteroids and Pac Man; remaking them with 3-dimensional graphics and stereo sound to capitalize on the latest generation of high-powered PCs. The company merged with JTS Corporation that same year. 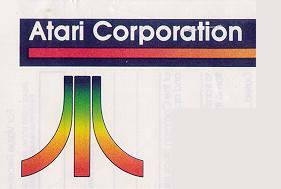 Following the merger, Atari functioned as a division of JTS until its purchase by Hasbro in March 1998. The rise and the fall of the pioneer firm of video game industry. Only 10 when the Nazis marched into his city of Lodz, Poland, in 1939, Jack Tramiel (then named Idek Tramielski) initially had a kid's thrilled reaction to the sheer spectacle of the scene: weapons glinting in the sun, soldiers goose-stepping, planes overhead. "It was a fantastic thing," he remembers. Reality crashed down after that. Lodz's Jews -- one-third of the city's 600,000 people -- were ordered out of their homes and into a crowded ghetto. For nearly five years Jack (an only child) and his parents lived there in one room, scavenged for food, and worked -- his father at shoemaking, Jack in a pants factory. The faces that the Tramiels saw in the ghetto changed constantly: Jews left, new Jews came in, often from other countries. Later Tramiel learned that the Jewish leader of the ghetto was parceling out its residents to the Germans, believing that the community would be left in relative peace as long as he periodically delivered up a contingent of its residents for deportation -- and no doubt extermination. In August 1944 the Tramiels themselves were herded into railroad cars, told they were going to Germany to better themselves, and instead shipped to Auschwitz. Jack's most vivid memory of the three-day trip is that each person received a whole loaf of bread as a ration -- a feast beyond his imagination. At journey's end, the men were separated from the women (at which point Jack lost track of his mother) and then themselves split into two groups, one permitted for the time being to live, the other sent to Auschwitz's gas chambers. Jack and his father were thumbed into the group that survived. A few weeks later, Jack and his father were "examined" by the notorious Dr. Josef Mengele and thumbed again into a survivors line. "What do you mean -- examined?" Tramiel is asked. "He touched my testicles. He judged whether we were strong enough to work." Having passed, Tramiel and his father were transported to a spot just outside Hanover, Germany, and there set to building a concentration camp into whose barracks they themselves moved. In weather that was often bitter cold, they worked in thin, pajama-like garments, and they grew increasingly emaciated on a deprivation diet: watery "soup" and bread in the morning, and a potato, bread, and more "soup" at night. By December 1944 the Tramiels were assigned to different work crews and seeing each other only occasionally. At one of their meetings the father told the son that many young people in the camp were managing to smuggle food to their elders -- and why hadn't Jack done that for his father? Stung, Jack studied for days how to deal with an electric fence that stood between him and an SS kitchen and finally succeeded in burrowing his thin frame under it to steal food -- one potato and some peels. But when he got the food to his father, malnutrition had gripped the older man and grossly swollen his body. He could not eat. Soon after, he died in the camp's infirmary. Later, Jack learned that the death was directly caused by an injection of gasoline into his father's veins. As the winter stretched into the spring of 1945, Jack Tramiel himself grew increasingly fatalistic. But then a strange end-of-the-war tableau unfolded. First, the Germans vanished from the camp; second, the Red Cross moved in briefly, overfed the prisoners to the point that some died, and then left; third, the Germans returned and then vanished again. On their heels came two American soldiers -- "20-foot-tall black men, the first blacks I'd ever seen," says Tramiel -- who loomed in a barracks door, peered at the prisoners hiding beneath the straw of their bunks, said something in English that one Jew gleaned as "More Americans will be coming," and left. Next a tank rolled up. In it stood a Jewish chaplain in dress uniform, who declared in Yiddish: "You are free," and told the tank to move on. These were troops of the advancing American Army, the month was April 1945, and Tramiel was 16. Tramiel, today 69 and a fireplug in build, stayed in Europe for more than two years after his liberation, and many of his recollections of those days concern food: how he tricked his way into a sanitarium to a rich, and shamefully fattening, diet; how he gorged happily while working in an American Army kitchen; how he did other odd jobs for "money or food." But he also learned during this time that his mother was alive and back again in Lodz. He saw her there but then left, resolved by that time to marry a concentration-camp survivor he'd met, Helen Goldgrub, and go with her to the U.S. The two wed in Germany in July 1947. They got to the U.S. separately, though -- he first, in November of that year. His confidence, strengthened by what he'd survived, bordered on hubris: "I figured I could handle just about anything," he says. He started out living at a Jewish agency, HIAS, in New York City; got a job as a handyman at a Fifth Avenue lamp store; learned English from American movies; and at their end pigged out on chocolate instead of eating regular dinners. Then, in early 1948, he did the improbable, joining the U.S. Army. By the time he left it four years later, he'd been reunited with his wife and fathered a son (the first of three). The Army had also pointed him to a career by putting him in charge of repairing office equipment in the New York City area. When Tramiel checked back into civilian life, he entered a long period of close encounters with machines that typed words and manipulated numbers. He first worked, at $50 a week, for a struggling typewriter-repair shop. Using his Army connections, Tramiel got the owner a contract to service several thousand machines. "The guy flipped," says Tramiel, but did not give his enterprising employee a raise. "I have no intention of working for people who have no brains," said Tramiel to the owner, and quit. Tramiel then bought a typewriter shop in the Bronx. He did repair work for Fordham University and, when he once got a chance to buy scads of used typewriters, rebuilt and resold them. He next prepared to import machines from Italy but found he could get the import exclusivity he wanted only by moving to Canada. It was in Toronto, in 1955, that he founded a company he called Commodore, an importer and eventually a manufacturer of both typewriters and adding machines. Why Commodore? Because Tramiel wanted a name with a military ring and because higher ranks, such as General and Admiral, were already taken. Commodore went public in 1962 at a Canadian bargain-basement price of $2.50 a share -- a deal that raised funds Tramiel needed to pay off big loans he'd gotten from a Canadian financier named C. Powell Morgan, head of Atlantic Acceptance. Deep trouble erupted in the mid-1960s when Atlantic, to which Commodore was almost joined at the hip, went bankrupt, amid charges of fraudulent financial statements, dummy companies, and propped stock prices. Tramiel was never charged with illegalities, but an investigative commission concluded that he was probably not blameless. In any case, the Canadian financial establishment ostracized him. Struggling to keep Commodore itself out of bankruptcy, he was forced in 1966 to give partial control of the company to Canadian investor Irving Gould. Commodore's line then was still typewriters and adding machines, but the electronics revolution was under way and setting up shop in Silicon Valley. Tramiel himself moved there in the late 1960s and soon, displaying a speed-to-market talent that has characterized his whole life, had Commodore pumping out electronic calculators. In time, one product, a hand-held calculator, grew so popular that it was self-destructive: The company that supplied Commodore with semiconductor chips, Texas Instruments, decided to produce calculators itself -- selling them at prices that Commodore couldn't match. With Commodore again reeling, Tramiel vowed never again to be at the mercy of a vital supplier. In 1976 he made a momentous acquisition: MOS Technology, a Pennsylvania chip manufacturer that also turned out to be extravagantly nurturing about 200 different R&D projects. Tramiel, a slash-and-burn, early-day Al Dunlap in management style, killed most of the projects immediately. But he listened hard when an engineer named Chuck Peddle told him the company had a chip that was effectively a microcomputer. And small computers, said Peddle, "are going to be the future of the world." Willing to take a limited gamble, Tramiel told Peddle that he and Tramiel's second son, Leonard, then getting a Columbia University astrophysics degree, had six months to come up with a computer Commodore could display at an upcoming Comdex electronics show. They made the deadline. "And everyone loved the product," says Tramiel, relishingly rolling out its name, PET, for Personal Electronic Transactor. Unfortunately, this was potentially an expensive pet, carrying a lot of risk -- and demanding, says Tramiel, "a lot of money I still did not have." So he determined to gauge demand by running newspaper ads that offered six-week delivery on a computer priced at $599, a seductive figure on which Tramiel thought he could still make a profit. The ads appeared, and a hugely encouraging $3 million in checks came back. Commodore got to the market with its computer in 1977, the same year that Apple and Tandy put their micros on sale. In the next few years, Tramiel drove those competitors and others wild by combatively pushing prices down and down, to levels like $200. He also became famous for rough treatment of suppliers, customers, and executives -- and about it all was fiercely unrepentant. "Business is war," he said. "I don't believe in compromising. I believe in winning." Which is what he did in those early years for computers, leading Commodore to $700 million in sales in fiscal 1983 and $88 million in profits. At its peak price in those days, the stock that Tramiel had sold in 1962 at a price of $2.50 a share was up to $1,200, and his 6.5% slice of the company was worth $120 million. But then, in early 1984, just as annual sales were climbing above $1 billion, Tramiel clashed with a Commodore stockholder mightier than he, Irving Gould -- and when the smoke had cleared, Tramiel was out. The nature of their quarrel was never publicly disclosed. Today, however, Tramiel says he wanted to "grow" the company, and Gould didn't. Commodore was really Tramiel's last hurrah. True, he surfaced again quickly in the computer industry, agreeing later in 1984 to take over -- for a pittance -- Warner Communications' floundering Atari operation. But in a business changing convulsively as IBM brought out its PC and the clones marched in, Atari was a loser and ultimately a venture into which Tramiel was unwilling to sink big money. Eventually he folded Atari into a Silicon Valley disk-drive manufacturer, JTS, in which he has a major interest but plays no operational role. Today Tramiel is basically retired and managing his money. From four residences, he's cut down to one, a palatial house atop a foothill in Monte Sereno, Calif. In its garage are two Rolls-Royces, a type of luxury to which Tramiel has long been addicted. Naturally, charity fundraisers look Tramiel up. When those for the Holocaust Memorial Museum appeared, he at first thought of it as just one more philanthropic cause to be supported. But his wife, Helen, 69, who spent her concentration camp days at Bergen-Belsen, is intensely aware that both she and her husband survived what millions of other Jews did not. "No," she said adamantly, "for this one we have to go all out."